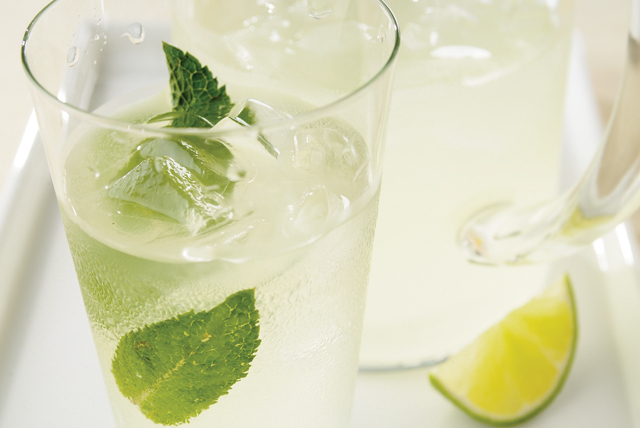 Prepare a refreshing and quick Easy Mojito for your next gathering with friends. Making this mojito takes only 10 minutes, so it's ideal for a celebration. Place 2 mint leaves in each of 3 tall glasses. Use back of spoon to crush mint to release its flavor. Fill glasses with ice. Mix remaining ingredients in plastic or glass pitcher until drink mix is dissolved. Prepare drink as directed, omitting the rum and adding 2 drops rum extract to lemonade mixture before pouring into prepared glasses. Garnish each filled glass with a lime slice.